"The team that did go said they had an amazing time! 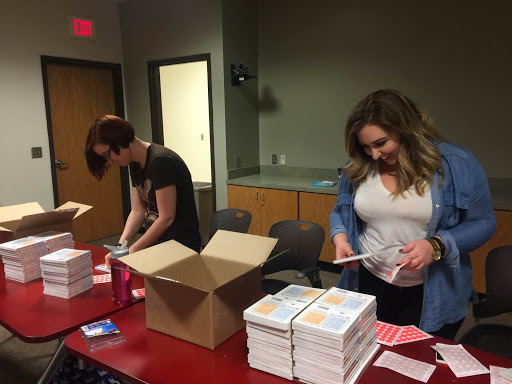 They worked in the main office labeling books and between the five of them, they labeled and boxed 4,200 books in two hours, which is pretty impressive. The team is very excited about this organization and wants to continue to help them out! I am going to help them host a book drive in our office during Reach Out and Read's Annual Hooked on Books fundraiser, so we are really excited about that too!" If you're looking to get involved just like Go Local Interactive, email outreach@thecallkc.org and ask about our Corporate Cares program. Tickets are on sale now for Books on Tap, Kansas City's "party with a purpose" benefiting Reach out and Read Kansas City at the Kansas City Public Library on September 23. Read Out and Read Kansas City began in 1997 as a collaboration between pediatricians at Children's Mercy Hospitals and University of Kansas Medical Center and KU Pediatrics.The unique partnership has grown to a coalition of more than 50 clinics in the metro with an emphasis on serving our community's most vulnerable children at-risk of literary failure. Formerly known as Books & Brews, this year’s event has a new name but will take place in a familiar setting-- the stunning rooftop event space of the downtown branch of the Kansas City Public Library. Meet and mingle with good friends, old and new, while enjoying food and libations from a host of local favorites. Every year, Reach Out and Read Kansas City provides more than 76,500 new, culturally, and developmentally appropriate books and literacy advice to nearly 30,000 low-income children and their families during pediatric check-ups at 50 partner clinics throughout the metro. Through Reach Out and Read, each child can build a 15-book library before they enter kindergarten. For many families, these are the only books in their home. By attending Books On Tap, you are providing enough support to purchase five books - that's one third of a child's 15-book library! Tickets are $25 in advance, $35 at the door. Additional raffle tickets are available at the event for $5 each or five for $20. All guests must bring a valid ID. To purchase tickets, click here.